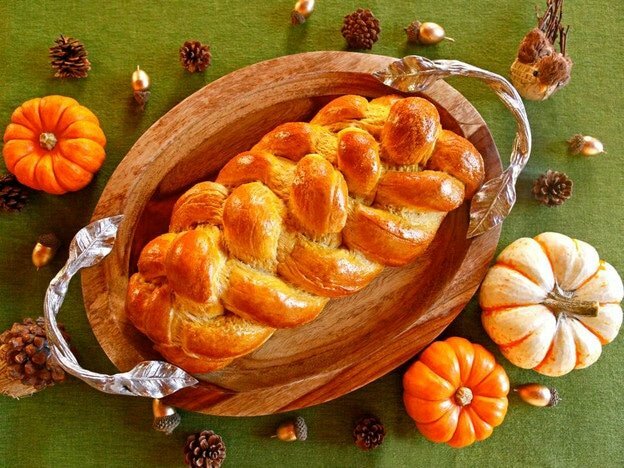 Pumpkin Challah combines two holiday traditions into one delicious, beautifully braided treat! This lightly sweet, pumpkin-scented bread is the perfect centerpiece for an autumn holiday table. With autumn upon us and squash decorating lining the aisles of the produce section, my mind keeps drifting to pumpkins… or, more specifically, to Pumpkin Challah Bread. 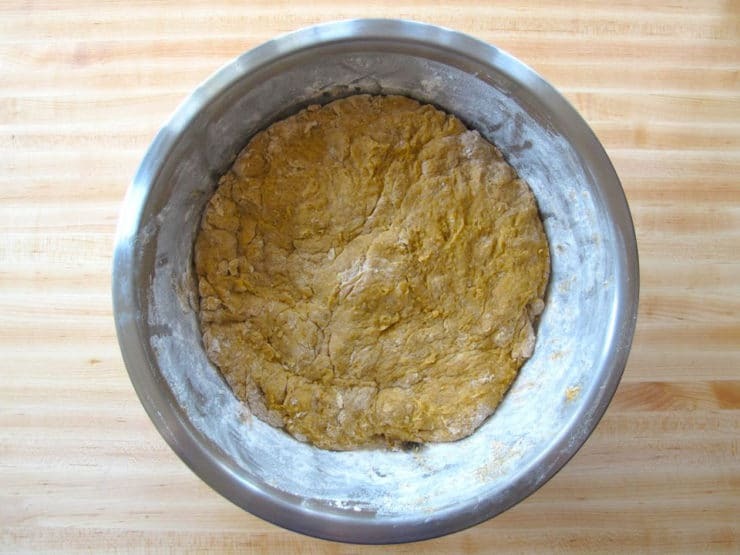 A few months ago, Rob Eshman of the Jewish Journal’s Foodaism blog sent me his Sukkot recipe for pumpkin challah. Last week, I decided to try my own creative spin on his inspired idea. I wanted to add more sweetness and spice to the dough to give the bread a pumpkin pie essence while still retaining that wonderful eggy challah texture. I started with my standard challah recipe, added pumpkin puree, and played with the ingredients till I came up with the right balance of sugar, spice, and everything nice. This recipe is the result of my little baking experiment. It’s sweet, but not cloying, and would make a unique and beautiful addition to the Sukkot or Thanksgiving table. It’s really tasty dipped in hot tea or cocoa, and makes a wonderfully cozy fireside snack. Top it with melty butter and honey for extra deliciousness. And here’s the best part—it makes mind-blowingly delicious Challah French Toast. Wow. I’m making myself hungry. 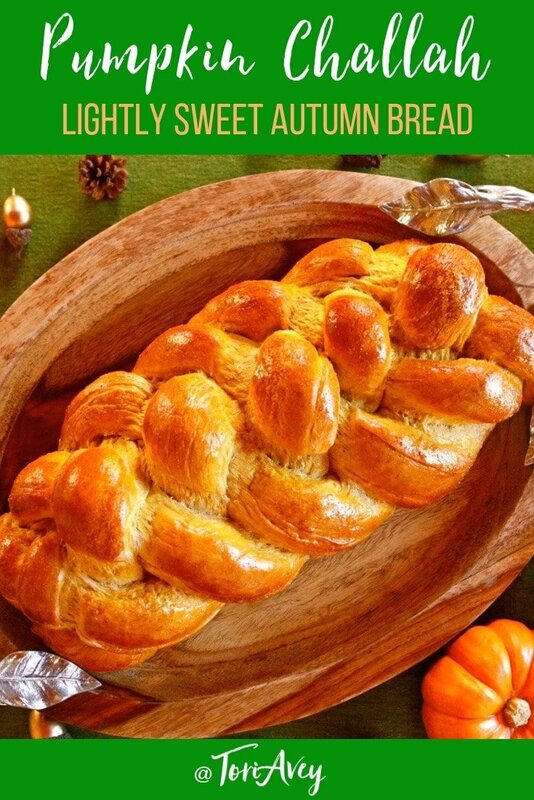 For challah braiding instructions, click here. Enjoy! A mildly sweet, spice-scented Pumpkin Challah. 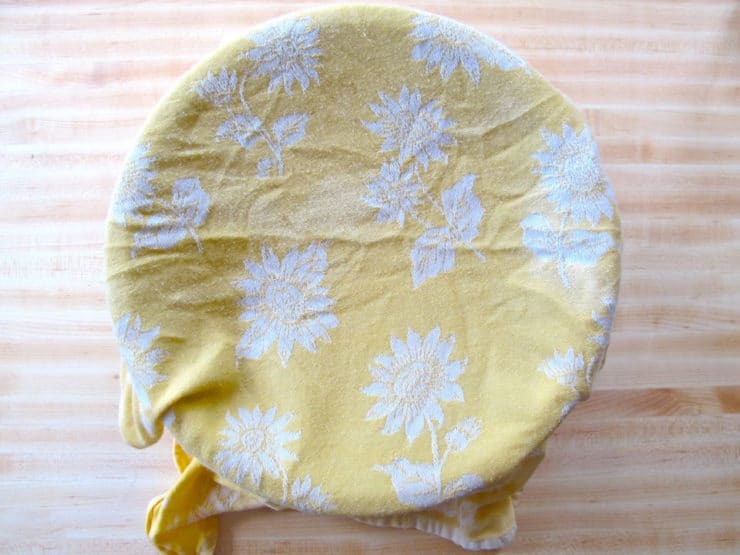 Perfect for Sukkot, Thanksgiving, Thanksgivukkah or any autumn meal. Kosher. Pour ½ cup of the lukewarm water (about 110 degrees) into a large mixing bowl. Add 2 packets of Active Dry Yeast and 1 tbsp of sugar to the bowl, stir to dissolve. Wait 10 minutes. The yeast should have activated, meaning it will look expanded and foamy. If it doesn’t, your yeast may have expired, which means your bread won’t rise—go buy some fresh yeast! 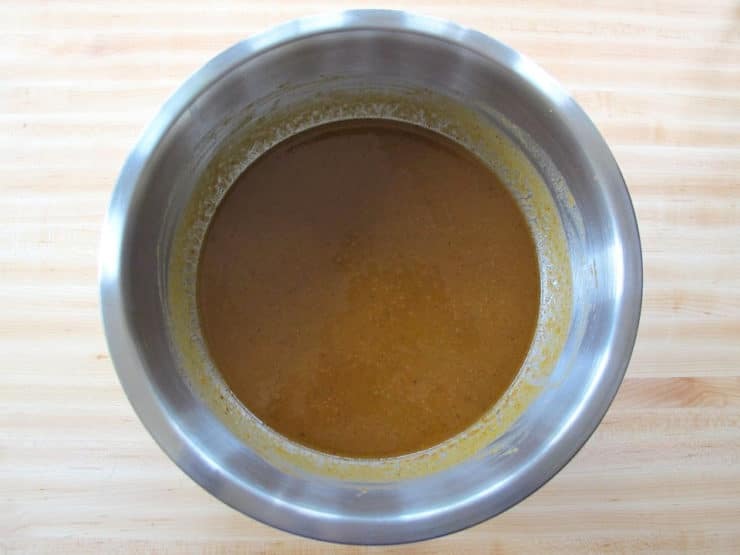 Once your yeast has activated, add remaining ½ cup lukewarm water to the bowl along with the rest of the sugar, egg, egg yolks, honey, canola oil, salt and spices. Use a whisk to thoroughly blend the ingredients together. 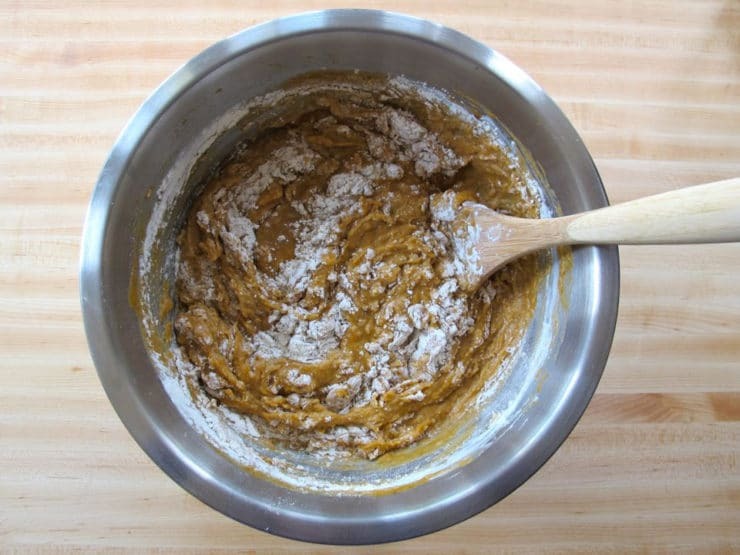 Whisk in the brown sugar and pumpkin puree to form a thick liquid. Place a saucepan full of water on the stove to boil. Meanwhile, remove the dough from your mixing bowl and wash out the bowl. Grease the bowl with canola oil. 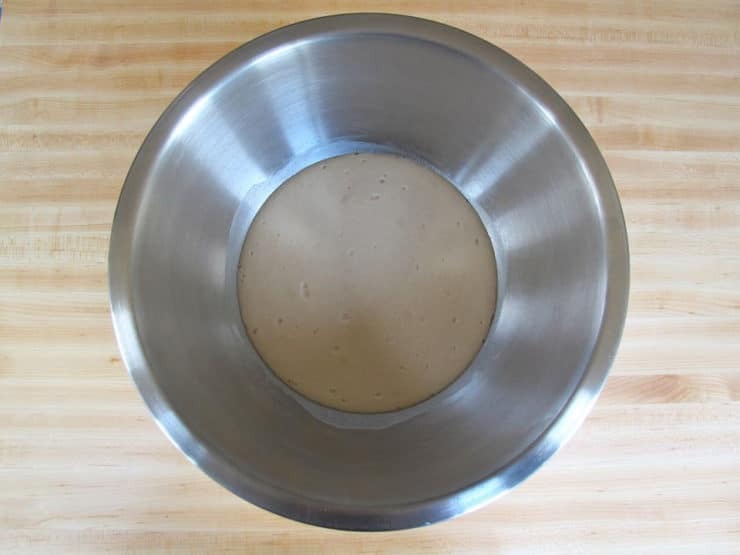 Push the dough back into the bottom of the bowl, then flip it over so that both sides are slightly moistened by the oil. Now your dough is ready to braid. 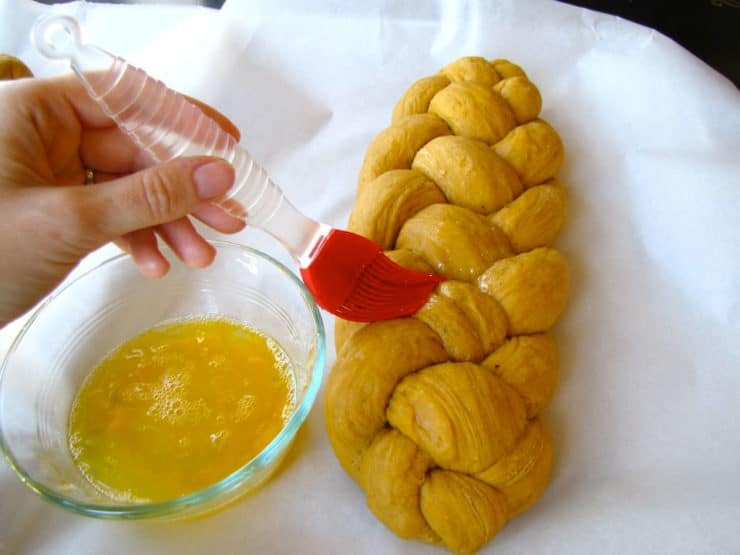 If you plan to separate and bless the challah, do it prior to braiding. 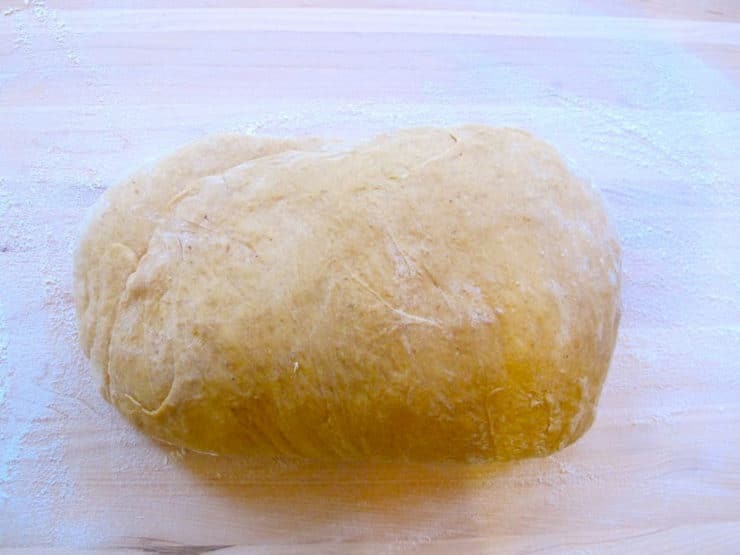 Separate the dough into two equal portions; each portion of dough will be enough for a large loaf of challah. Click here to learn How to Braid Challah. 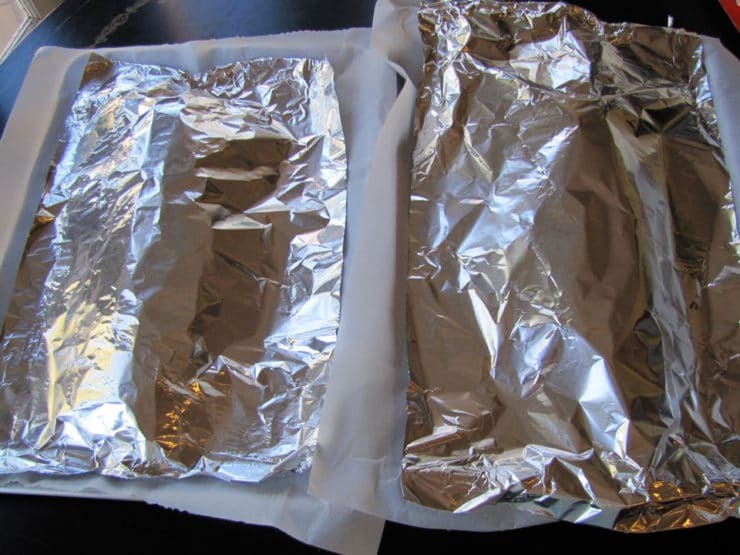 After you’ve braided your challah loaves, place them on two separate cookie sheets lined with parchment paper (this will catch any spills from your egg wash and keep your challah from sticking to the cookie sheet). Prepare your egg wash by beating the egg yolks and water till smooth. 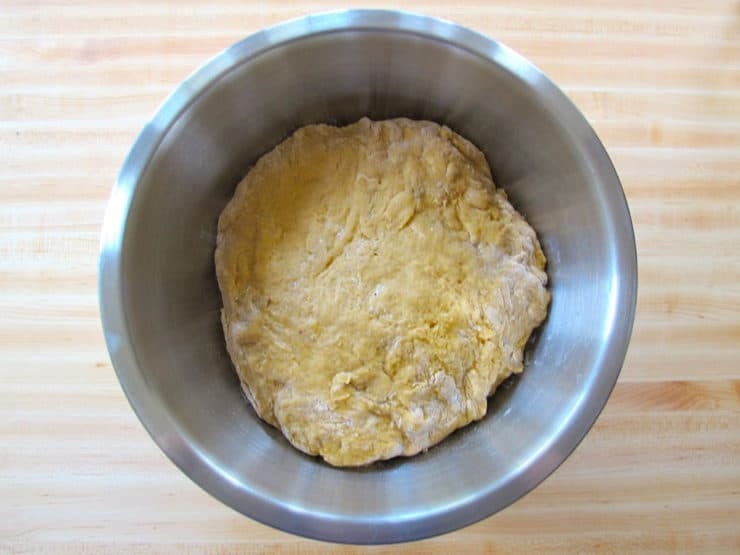 Use a pastry brush to brush a thin layer of the mixture onto the visible surface of your challah. Preheat the oven to 350 degrees F. Let the braids rise 30 to 45 minutes longer. You’ll know the dough is ready to bake when you press your finger into the dough and the indentation stays, rather than bouncing back. The challah will need to bake for about 40 minutes total, but to get the best result the baking should be done in stages. First, set your timer to 20 minutes and put your challah in the oven. After 20 minutes, take the challah out of the oven. Turn the tray around, so the opposite side is facing front, and put the tray back into the oven. Turning the tray helps your challah brown evenly—the back of the oven is usually hotter than the front. Take the challah out of the oven. You can test the bread for doneness by turning it over and tapping on the bottom of the loaf—if it makes a hollow sound, it’s done. Let challah cool on the baking sheet or a wire cooling rack before serving. This challah was the highlight of our Thanksgiving weekend!!!! It’s officially been added to the family’s list of “must haves” for our gathering. In your recipe you include 6 egg yolks. I wonder why you use just egg white and not the whole egg? What does the egg white contribute to the challah? Hi Esti, after a lot of experimentation with challah dough I found that the yolks create a richer flavor in the dough, and a better texture. That is just my preference. I’ve made this for Thanksgiving and Sukkot for the past several years (since “the shiksa in the kitchen” days) and it is a HUGE hit every time. Thanks for a winner of a recipe! Hi Tori! 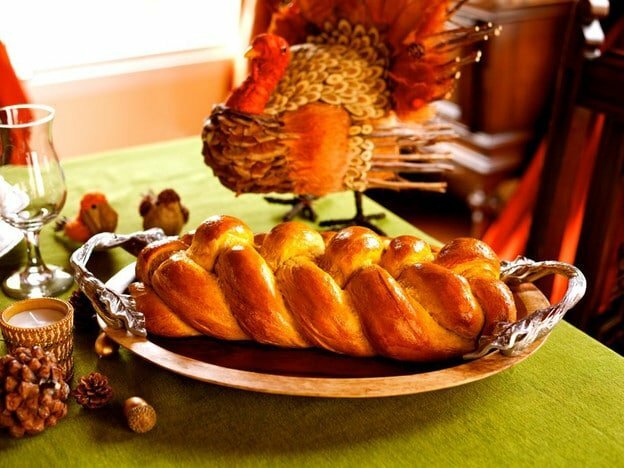 I’m definitely going to make this for Thanksgiving but I’m thinking of making it into rolls instead of a big loaf. How many rolls do you think this would make and how should I adjust the baking time? Hi Carin, rolls will be a shorter bake time. I would start checking them around 20 minutes or so. 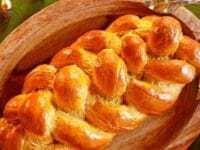 Is the challah pictured braided using the 4-strand or 6-strand method? This is an excellent recipe. I even like it better than regular (non-pumpkin) challah because the pumpkin adds moisture and makes the dough easier to work with. I want to bring this as a dish to a Thanksgiving party I’m going to, but we already have quite a lot of desserts, so I don’t want to add too much to the sweet stuff! How sweet is this… Do you have this after dinner as dessert or do you normally enjoy this with the main meal? It’s slightly sweet, not like a dessert. If you’ve ever had Hawaiian rolls, that is about the sweetness level. Enjoy! Do you have baking instructions for individual rolls? This recipe is a favourite of my husband’s and mine. This year we are going to make it for T’giving and I’d like to half the recipe as we are having a smaller than normal group for dinner. Can you give me any tips for cutting the recipe back? I always want to just cut every ingredient in half but someone….I seem to remember that it’s not as simple as that! Glad you like the recipe Kathleen! Cutting baked recipes without testing them can lead to issues. If I were you, I would go ahead and make the full recipe and freeze the leftover loaf… or give to one of your guests as a gift! Halving the recipe might work, but I hesitate to tell you to try it without first testing it myself. Freezing the extra loaf is a great idea Tori! I’ll save it for a real cold day when I need a slice of warm bread! Everyone loves the flavor of your pumpkin challah; I’ve now made it twice. I am at a quandary though. 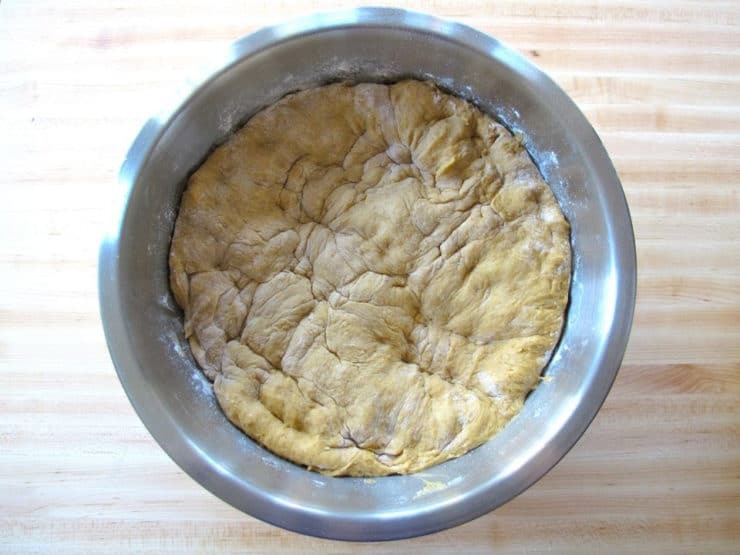 I tend to use a bread machine for preparing the dough for rising. This time, even more than the first time, the bread result when the dough was supposedly ready for baking, was half just dry and the other side wet glop. We ended up pouring it into a bow to knead by hand and added several cups more flour until it was the right consistency to rise. Help! I really don’t know what to do with this, especially as it happend twice. We too love your Date Orange Challah which works perfectly in the bread machine. 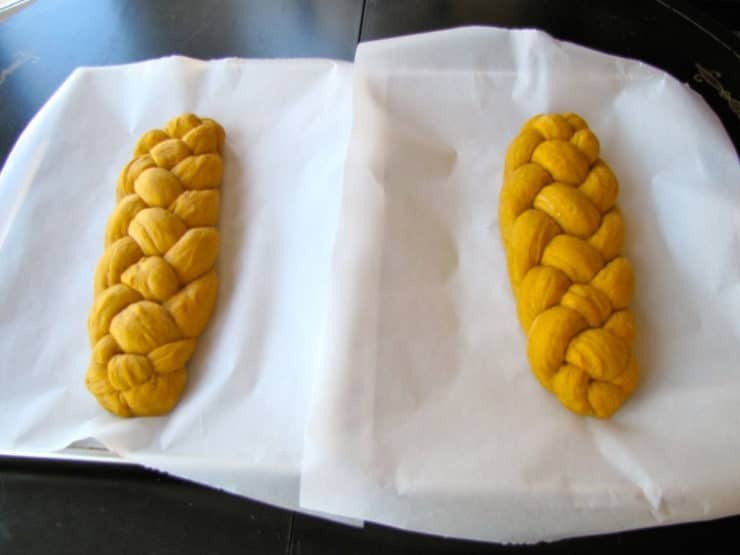 Since I’ve never made challah, would it be possible to use a frozen challah dough & add pumpkin puree and spices to it? Hi Jackie, Tori’s assistant Ashley here. Unfortunately we have not experimented with this recipe using a pre-made challah dough, so I cannot guarantee the outcome. If you decide to give it a try please let us know how it goes! A++++++ recipe!!! Will be making a few loaves for Thanksgiving. Perfect combination for Challah and Pumpkin Pie lovers. Have to confess I cheated using a bread machine for making the dough – and then took out to braid/shape before letting rise again and baking. I also added 1 teaspoon of vanilla to the egg wash and topped with Pearl Sugar before baking (my kids love the pearl sugar!). Recipe is perfect with or without vanilla/pearl sugar topping – thanks for sharing! I’ve made this before and it’s DELICIOUS! DELICIOUS! I have made this more than once; it tastes like a donut without the frosting. It makes 3 humongous challos; I would maybe even make 4 medium challos. I have made with pumpkin and other hard squashes; the best one is buttercup since it is so dense and sweet to begin with. I’ve always been a little intimidated by homemade bread (anything that involves dough not made in a bread machine). I’ve made four loaves of this so far, and they’ve been perfect and delicious. The step by step recipe and photos really helped me along…I knew exactly what I was supposed to be doing and what everything was supposed to look like. And the braiding was easy and fun! I did four strand, next time I will try six. I gave loaves as gifts and everyone is raving. I just made french toast with ours and it is fabulous. Thank you! My mom and I made it together. Delicious! 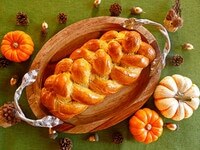 Thank you for your recipes, I made your Challah for Rash Hashana and now will try Thanksgiving recipe. My question what kind/ brand of pumkin puree do you use or do you have a recepie how to make a pumkin puree? And the second question if I will bake Challah in the morning what is the best way to keep it fresh for dinner time. Sorry for the delayed response Julia. Any pumpkin puree will work, canned or homemade. 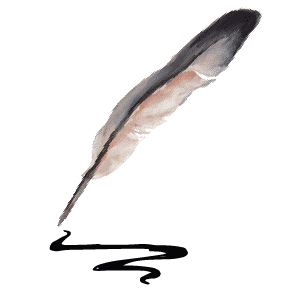 Hi – how sweet is this recipe? I want to make it to use in stuffing (with leeks, celery, carrots, mushrooms, apples, dried cranberries, and sausage, but am concerned that with both 1/4 c honey and 1/2 c brown sugar it might be too sweet. Thoughts on cutting back or leaving out the brown sugar? Martha Stewart has a recipe that is similar to yours, but uses twice as many eggs (!!) but only the 1/4 cup of honey. Hi Shari, it is not overly sweet but it does have a slight sweetness to it. If you are using it for stuffing with apples (which add their own sweetness) I would cut the brown sugar to 2 tbsp. Enjoy!